If you haven’t been following Monster Energy Supercross you’d probably think chaos would be unpredictable. But if you have, you know exactly what predictable chaos is. 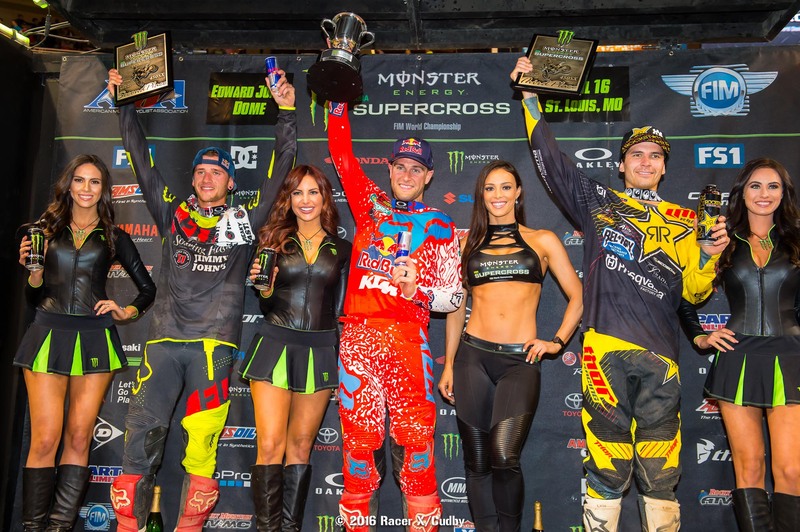 For example, the 250SX East class has been reliably crazy this year, and the last few 450SX races have featured some pretty exciting battles up front. So how’d these trends play out in St. Louis? Let’s dive into Saturday Night Live to find out. Roczen was no doubt unhappy about going down while chasing Ryan Dungey and throwing away his shot at the win, but you’ve got to give Roczen credit for keeping his head up, recovering, and going back on the offensive to get Anderson with just a few turns remaining to finish second. 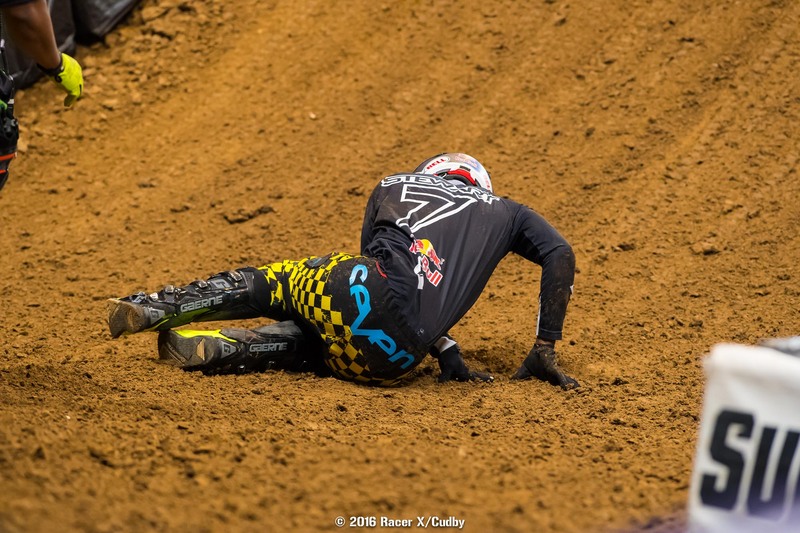 Anderson was extremely unhappy and felt Broc Tickle, who is just getting back into the swing of racing after being sidelined for most of the season with injury, had gotten in his way as the two were lapping him right at the end. But did he? Tickle doesn’t think so. “I thought maybe I was in the way, but I came back and watched video and I wasn’t in the way at all,” Tickle said to Racer X’s Steve Matthes later. 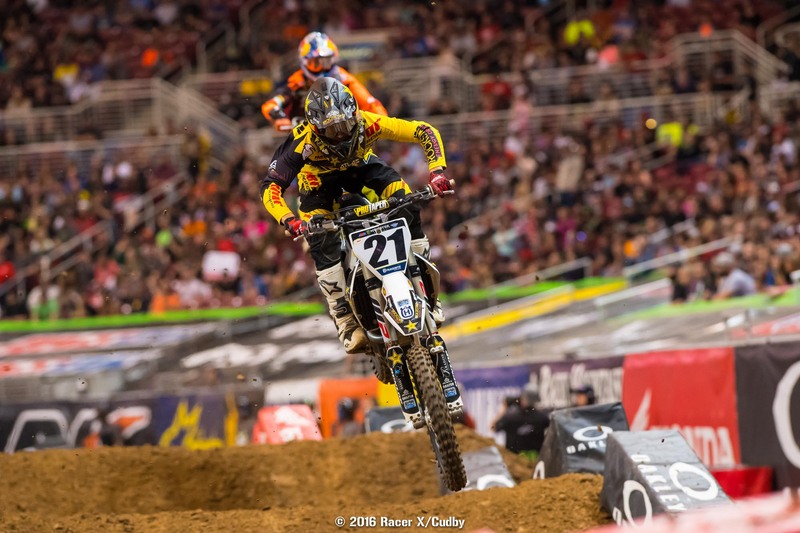 If you’re a Chad Reed fan, and who isn’t these days, you’ve got a big reason to be happy. 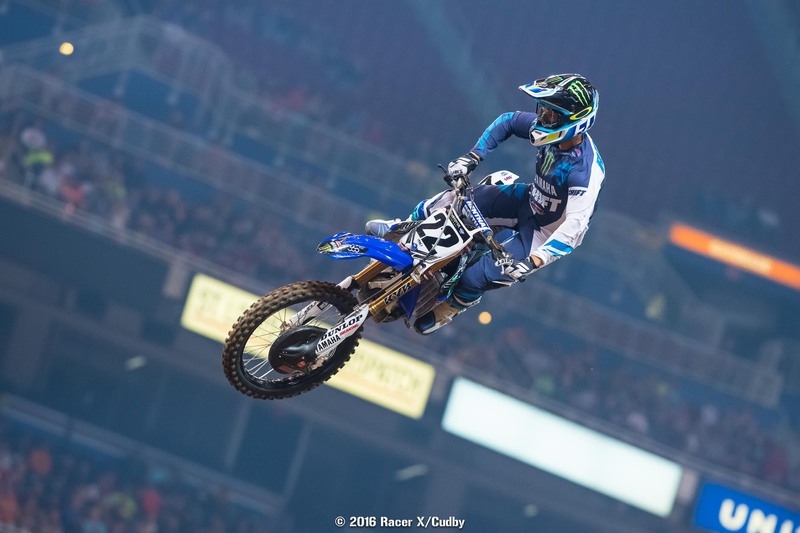 St. Louis was the 200th supercross start for the veteran, and when he was being interviewed about it on the track floor he said he’d like to break the 220 mark before retiring, which means we’ll get to see him race for at least another two seasons. Justin Bogle has quietly been putting in some good rides after missing several races early in the season with injury. 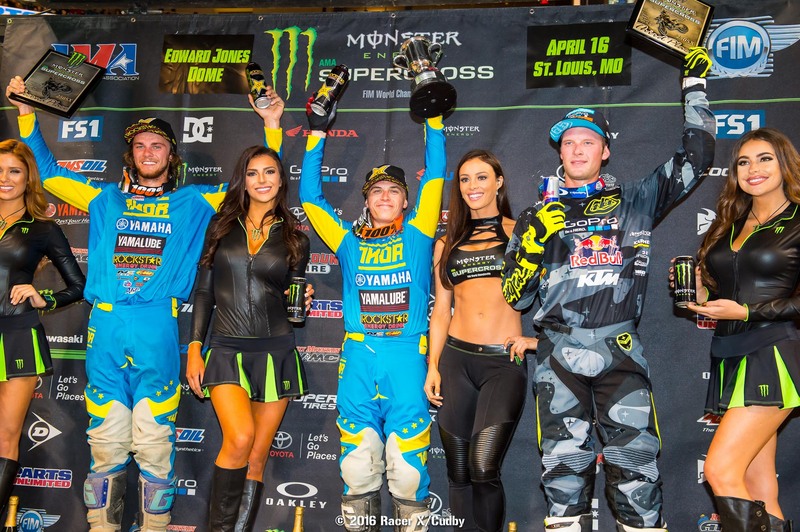 The trend continued in St. Louis, where Bogle got a decent start, worked his way around Marvin Musquin and Josh Grant to eventually finish fourth, a career best for the GEICO Honda rider. Not the greatest of nights for CycleTrader.com/Rock River Yamaha. 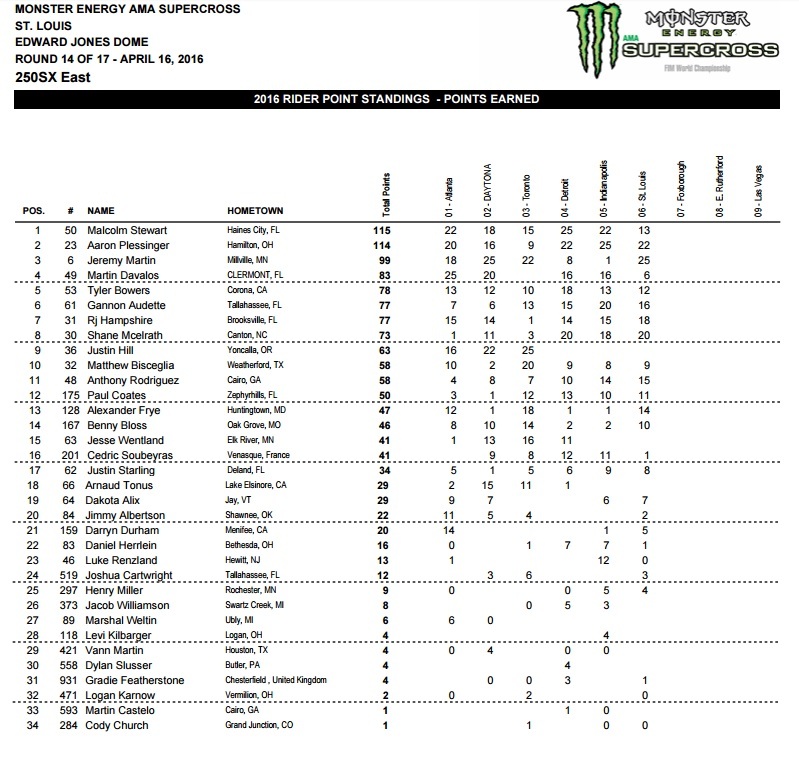 The team’s two lead riders, Tommy Hahn (450SX) and Luke Renzland (250SX) weren’t in their respective mains. St. Louis was Hahn’s first race back after sustaining a medial sprain in his right foot. He qualified fourteenth, but ended up sitting out the races due to foot pain. At this time the team is unsure whether or not he’ll be back next week. Renzland raced, but bad starts did him in. In the LCQ he got to within inches of Gradie Featherstone for the final transfer spot and would have taken it if there was one more turn. But, there wasn’t and Featherstone narrowly avoided what would have certainly been a hard pass. Speaking of frustration, James Stewart has got to be feeling it in spades right now. Stewart attempted to race after hurting his ankle last week in Indianapolis, but re-aggravated a back injury during practice and was experiencing back spasms. He tried to race his heat, but things didn’t go great. A line change from Stewart ended up with Weston Peick getting into the back of him, leaving Stewart on the ground. Stewart rode the rest of the heat, but the back spasms continued back in the pits and that was it. Malcolm Stewart had a frustrating night too, crashing three times in the main event. The first time was after he stalled in the sand section, the second was by himself in a corner, and he crashed again near the very end of the race. Still, it could have been way worse—you’d expect someone who crashed three times to finish worse than eighth. Stewart even maintained the points lead, but just barely. 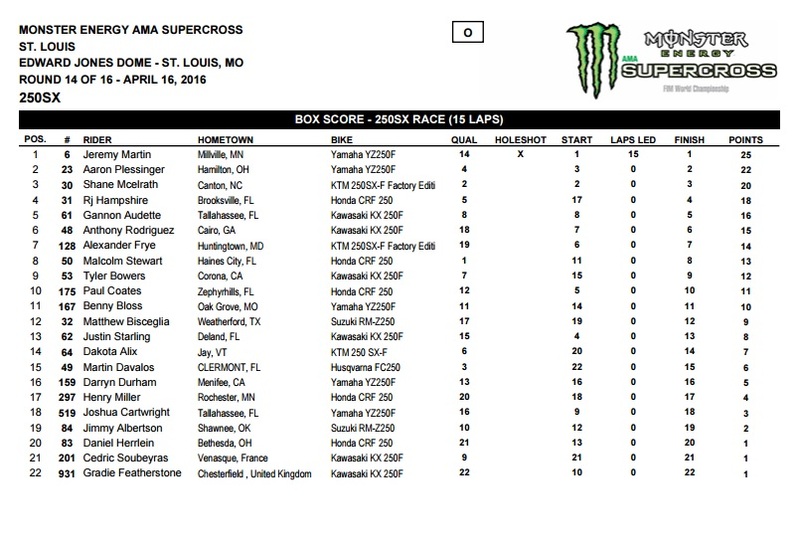 He now leads Plessinger by one point after coming into St. Louis with a ten-point cushion. If you’re wondering who Cedric Soubeyras is, wonder no more. 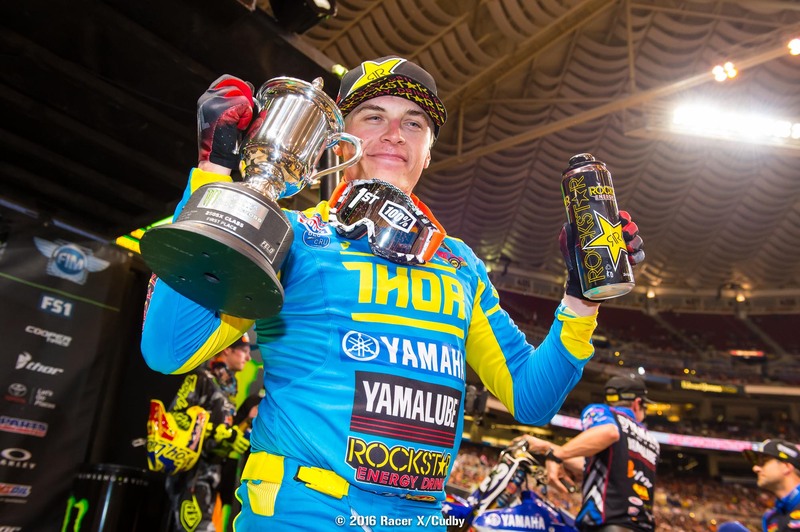 He’s an accomplished French rider who saved up money earned from racing internationally to fund a season of 250SX in America and has been qualifying for races regularly. He didn’t have the best results today—he finished 21st—but he nearly didn’t even get to race at all. The Frenchman blew his engine during practice and was set to pack it up for the day when LeBigUSA.com’s Stephan Legrand talked to Mitch Payton, who then offered up the use of a spare engine from Monster Energy/Pro Circuit/Kawasaki. Unfortunately a crash with Martin Davalos on the start caused throttle cable damage that would later force a DNF, but Soubeyras was still in good spirits afterward, telling us riding with a Pro Circuit engine has been a dream of his for years. He wasn’t at liberty to discuss details, but he did tell us it was the strongest 250 engine he’d ever ridden in his life. Some of the best entertainment of the night came during the KTM Jr. SX Challenge when Jayce Cashdollar and Zy Floyd went 1-2and proceeded to celebrate by doing their best impression of Aaron Plessinger and Malcolm Stewart by busting some serious dance moves for the crowd for a good two minutes. So great was their enthusiasm two track officials had to rush over and divert traffic to ensure the two didn’t get hit by any other racers coming over the finish line. 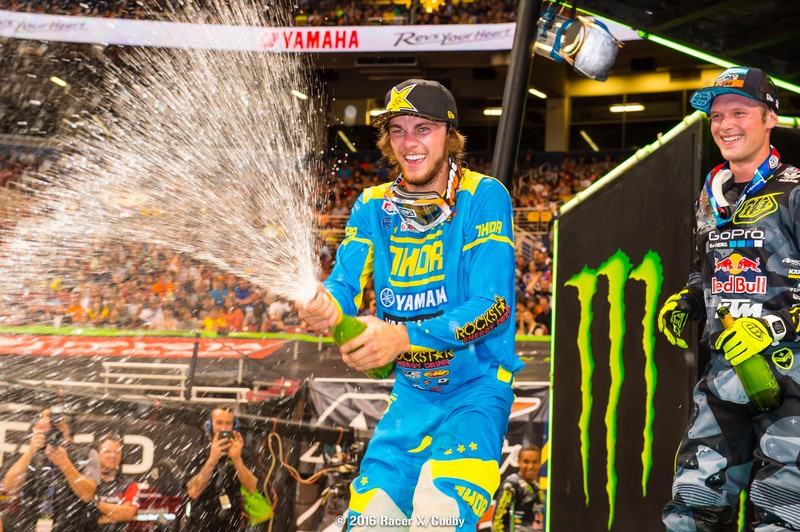 Hey, when you just won a supercross race and your last name is Cashdollar, you gotta bust out the money moves! Eli Tomac and Jake Weimer got this one going by stacking it up in the first turn, while Ryan Dungey jumped out to the lead with Ken Roczen right behind him. For the third straight weekend a brawl for the lead ensued. Dungey was faster in some sections, with Roczen inching back up on him in others. The gap was probably literally less than a second for multiple laps, although Roczen had very few actual moments where he could have thrown a wheel in on Dungey cleanly. That changed with eleven laps to go when Roczen pulled up next to Dungey in a rhythm lane and made the pass, only to have Dungey knife underneath him and take it right back! The crowed was going absolutely crazy. Unfortunately the battle came to an end when Roczen lost the front right after the finish line and went down, giving up second to Jason Anderson in the process. 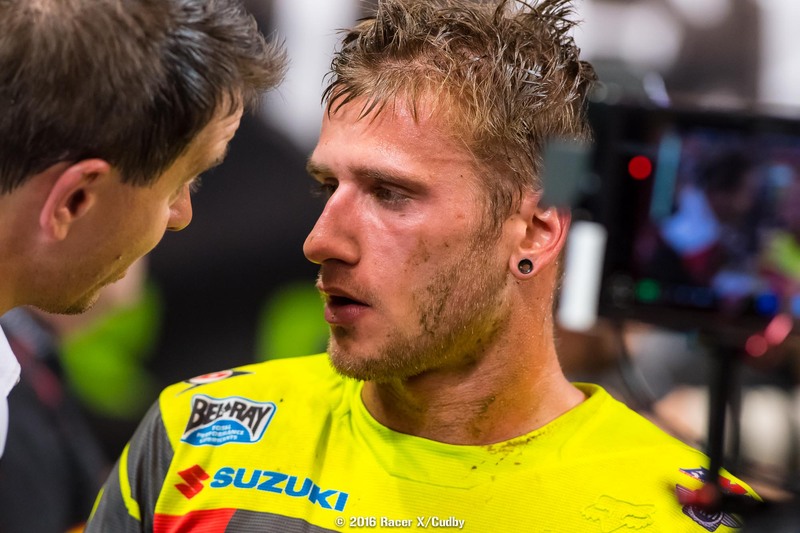 But Roczen wasn't done yet. After remounting and regrouping he put another charge in to get right back up on Anderson with about three to go. The two went at it and even started closing back up on Dungey a little bit, but it looked like Anderson was going to hang on for second. 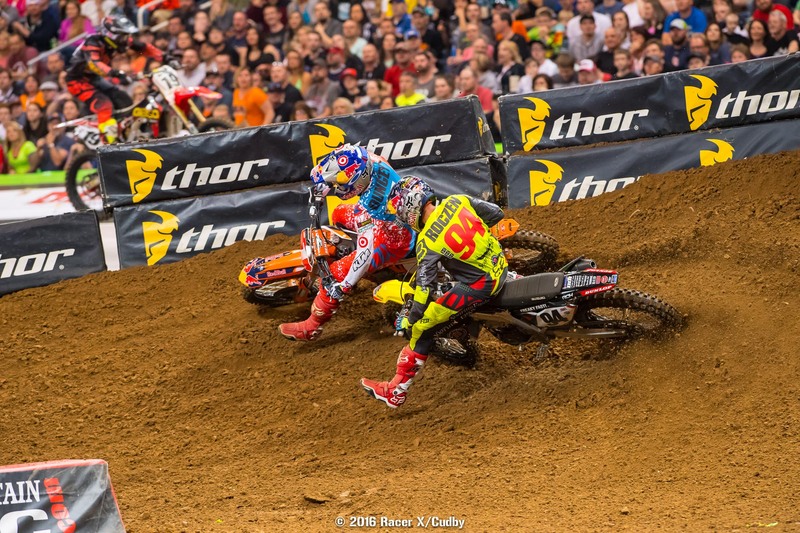 But then, with just a few turns left Roczen got Anderson back for second. Afterward Anderson was clearly unhappy with Broc Tickle, who Anderson felt held him up and cost him second place. Tickle disagreed, and later even showed Racer X's Steve Matthes video to prove it. 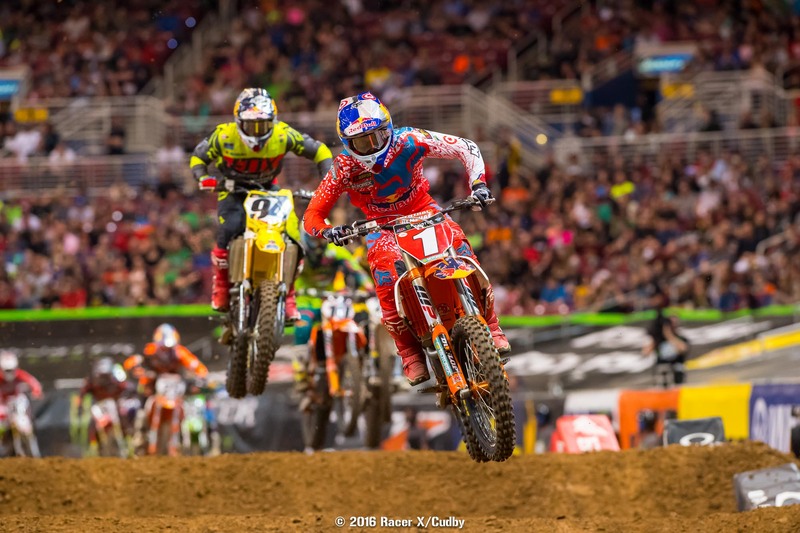 Dungey took the win, followed by Roczen, Anderson, Justin Bogle, and Trey Canard. Jeremy Martin narrowly edged Gannon Audette for the holeshot in this one and started taking off. Malcolm Stewart immediately got into second, but then stalled it in the sand, causing Matt Bisceglia and Gannon Audette to go down. Then Stewart crashed while trying to get going! Aaron Plessinger, who’d started in about tenth, took full advantage and sliced his way up to third and went to work on Shane McElrath while Stewart was back in about eighth. A few laps later Stewart went down again as he was blasting out of the sand section, smashing into some Tuff Blocks. He remounted in about fourteenth and slashed his way up to fifth or sixth before crashing again all by himself with just a lap and a half left. Meanwhile, Plessinger had gotten around McElrath and was going after Martin, who had about a six-second gap with eight to go. But as the laps wore on, the gap actually grew, and Martin would win his second race of the season. A terrible race for Stewart, but not total disaster. He kept his head down and minimized the damage you’d expect three crashes to inflict, finishing eighth, and kept the championship lead by a single point, thanks to gaining a position when Tyler Bowers went down on the last lap after colliding with a downed Jimmy Albertson. Plessinger and McElrath rounded out the podium, with RJ Hampshire putting in an excellent ride for fourth, followed by Gannon Audette. First, the track. The dirt it’s made out of is considered by many to be the best on the circuit, and during track walk this morning it was nice and sticky and almost completely free of rocks and random debris. Hopefully it stays nice and tacky, as the added grip could produce multiple lines. 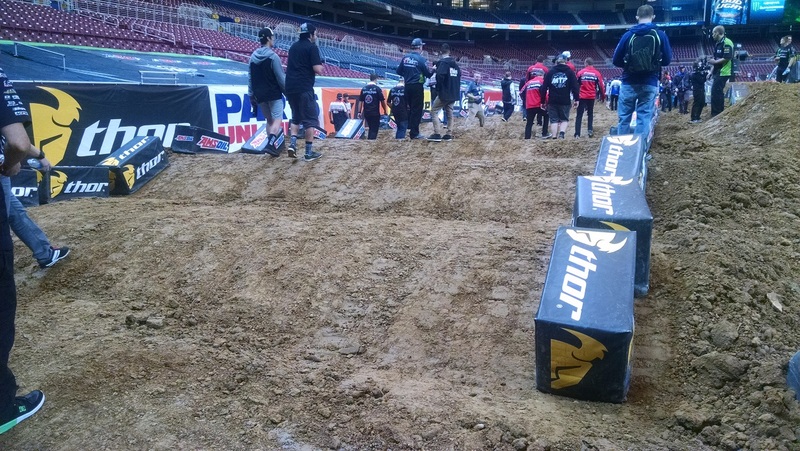 And if we’re lucky, we’ll see it rut up nice and big like last week in Indianapolis. There are a few big bowl turns which could produce some banging, a single whoop section, a long 180-degree sand section, and all the other normal obstacles you’d expect from Monster Energy Supercross. The finish line jump also goes over the first turn (only used once), which is kind of cool. On the injury front things are looking better than we’ve seen for many weeks, with our weekly Injury Report shrinking considerably this week. It’s a bummer for the unfortunate racers still hurt, but we’re glad to see a lot of the guys back in action. One of the riders getting back to it this weekend is James Stewart, who was sidelined last week after hurting his ankle. He appeared to be walking with a slight limp on track walk, so we’ll see how things go for him this afternoon. 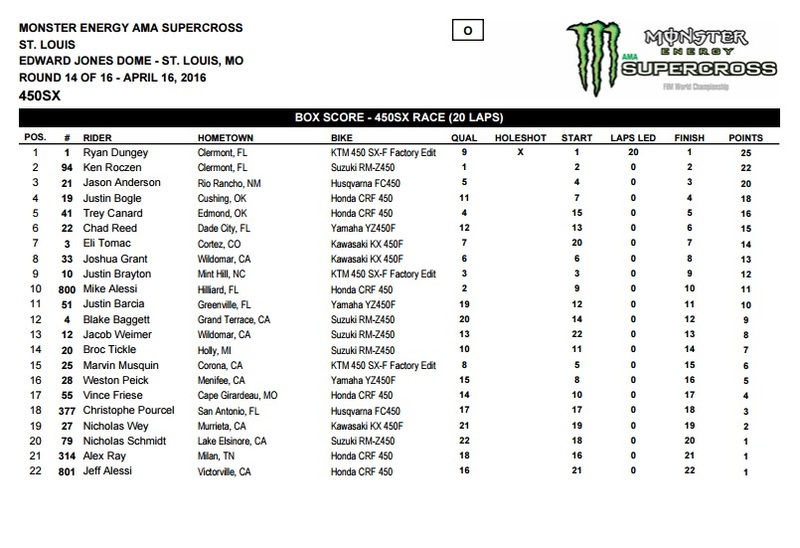 We mentioned things can get crazy in St. Louis, but no matter what happens to Ryan Dungey it’s impossible for him to lose the points lead—he’s up by 45 points over Ken Roczen. That doesn’t mean things won’t get nuts though, and hopefully we’ll see yet another epic twenty-lap duel between Dungey and Roczen. In 250SX action we have yet to see a repeat winner, and the way things have been going this year we may not see one today. Malcolm Stewart leads Aaron Plessinger by ten points, and tonight could prove critical in the championship. Even if Plessinger only cuts into Stewart’s lead by three points, a seven-point deficit looks much better than a thirteen-point gap with just three rounds to go. And let's not forget Gannon Audette, who scored his first career podium last week in just his first race as a fill-in rider with Monster Energy/Pro Circuit/Kawasaki! If things go well he might be showing us his go face.